The 1930 US Census is one of the most powerful resources available to anyone who wants to learn more about their ancestors. During the month of August, we’re giving everyone free access to Footnote.com’s one-of-a-kind, interactive 1930 US Census. 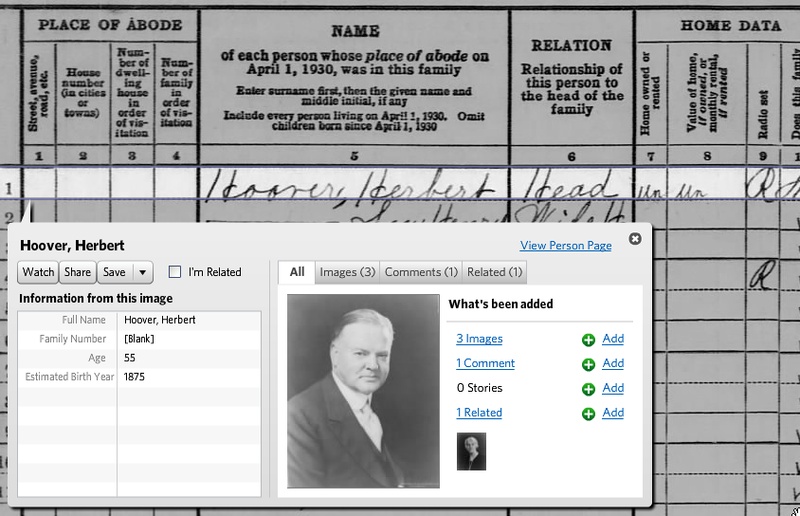 With Footnote’s interactive census, viewing, downloading and printing images from the census are just the beginning. You can also add images and comments, spotlight interesting finds, create pages for your ancestors and tell their stories. Note: To get the free access, you have to go through this page, http://go.footnote.com/1930census/ and if you aren’t signed in, you’ll be asked to register or sign in. Note #2: We’ve had a problem on the site so that you are being asked to subscribe to print or download an image. That wasn’t our intention and we should have it fixed later today. Update: You should be able to print and download with the free registered account now. When I attempted to register for the free trial I was told this email account already was registered. So I went to sign in under this email and was told this account didn’t exist. Since we opened up the 1930 census for free our servers have been overwhelmed which has caused a number of problems on the site. I wonder if the first message (your email is already taken) was related to these overwhelmed servers. I would recommend you try registering again and see if it goes through properly. If it’s still not working, you can contact us at support@footnote.com and we’ll see what we can do to help. Heb graag de gegevens van de fam.Roelink. Cannot access free 1930 census as my email and password are unacceptable, to you. What goes??? I registered last night was given a user name. Went in today and the 1930 (Free Census for the whole of August?) is no longer free?? It seems like it was a ploy to get people to register. I am so annoyed as I found a member of my family in England living there……Anyone else had this problem. I registered yesterday and today (wed) it won’t let me back in, It didn’t let me view or print the census pages??? When you first go to that page you should get small overlay screen with an orange button that says “Get free access now!” Clicking that button gets you on the path to free access. Once you are on the site through that route, you should be able to search, browse or get to the census anyway you like and have it be free, but the first time you come to the site, you need to go through that page. If you are going through this route and still not getting access, there must be some other problem. Please let us know if this doesn’t help. You can contact us at support@footnote.com. How do you get back to the main search page for the 1930 census so you can search for someone else? There are links to the 1930 Census page on the main homepage of Footnote, so you should be able to get back to it that way. But, once you are in through the 1930 Census page you should be able to use the main site search or browse and still get free access as long as you are on the site. Dont try it. Such a rip-off. It let me view free census 1 time then they wanted me to pay. Just a lure. Ill never come back to this site. dont waste your time people. Snake, Sorry you had a bad experience with the free census. The census was free for a limited time (a month or so), but you should have been able to get to it as many times as you tried during that time. If you ever run into problems with access, please let us know. You can reach us by sending an email to support@footnote.com. I WANT TO UNSUBSCRIBE FOR MY THEREE DAY SUBSCRIPTION WHICH WAS FREE, I HAD TO GIVE MY VISA NUMBER, I NOW WANT TO UNSUBSCRIBE BECAUSE I DID NOT FIND ANY INFO ON THE NAMES I GAVE. PLEASE ACCEPT MY NOTICE TO UNSUBSCRIBE BEFORE THEY START CHARGING MY.